The Liverpool Football Club (F.C.) is part of the Premier League Association – a European football association. The club is based in Liverpool, England and first joined the Football League in 1893 after its founding in 1892. Liverpool F.C. has won and impressive three UEFA Cups, five European Cups, seven FA Cups, three UEFA Super Cups, 18 League titles, 15 FA Community Shields and eight League Cups to date. The club became recognized during the 1970s and 1980s as a major force in European football. This came about due to the leadership of Bob Paisley and Bill Shankly who led the football club to 11 League titles and seven trophies. It was the highest-earning football club between 2014 and 2015 reporting an annual income of €391 million worldwide. It was the ninth most valuable football club in 2016 with a valuation of $1.55 billion. The club’s main rivals are Manchester United and Everton and supporters have been involved in two major incidents. In 1985 at the Heysel Stadium, fans trying to escape were pinned against a collapsing wall. The tragedy claimed the lives of 39 people in the incident resulting in a 5-year ban for the club from European competitions. The second disaster happened in 1989 at Hillborough where 96 fans died by being pinned to the perimeter fencing. Following a dispute between John Houlding (club president and Anfield land owner) and Everton, the club was founded. In 1982, the Everton football club moved to Goodison Park after which John Houlding founded the Liverpool Football Club, initially calling it “Everton F.C. and Athletic Grounds Ltd” or shortened to Everton Athletic. Official recognition was given to the club three months after changing its name to Liverpool F.C. in March 1892 after being refused under the name of Everton because there as already a team named Everton. In its debut season, the club won the Lancashire League and then joined the Football League Second Division in the 1893 to 1894 season. They finished at the top of the league and were subsequently moved to the First Division. The clubs first wins in the First Division came in 1901 and they won again in 1906. Liverpool Football Culb made it to their first FA Cup Final in 1914 where they lost to Burnley 1-0. The club won two consecutive League Championships in 1922 and 1923 followed by years of defeat, only winning their next trophy in the 1946 to 1947 season. In 1950, the club had its second Cup Final defeat against Arsenal. The club fell on hard times as it was relegated to the Second Division in 1953. After they lost to a non-league team, Worcester City, Bill Shankly took over management. He aggressively changed the way the club was being managed and created a room where coaches could strategize. He released 24 players and began to reshape the team with the help of Bob Paisly, Joe Fagan and Reuben Bennett. In 1962, the club was moved back into the First Division and won the Cup two years later. This was the first win in 17 years. It then went on to win the FA Cup in 1965 for the first time. The following year, the club won the First Division Cup again but lost in the final of the European Cup Winners’ Cup. They went on to win the UEFA and League cups in the 1972 season and the FA Cup in the subsequent year. Bob Paisley replaced Shankly as manager after his retirement and in his second season as the new manager, the club won both the UEFA Cup and the League Cup. They kept the League title the following year and had their first win at the European Cup in the same year. In 1978, Liverpool F.C. held onto their European Cup and won the First Division Cup again in 1979. In total, the club won 21 trophies during Paisley’s nine seasons as club manager only missing the FA Cup title. Joe Fagan took over for Pailsey after his retirement in 1983 and went on to win the European Cup, League Cup and the League in his first season making Liverpool F.C. the first local English team to win all three in one season. The team made it to the 1985 European Cup final where they were set to play against Juventus at Heysel Stadium. Before the game could start, fans broke through the fence that kept the two groups of fans apart. Liverpool fans charged the Jevuntus fans resulting in 39 fatalities as the walls collapsed on fans. The match continued in spite of the tragedy and Liverpool F.C. lost 1-0. The club received a 10 year ban that was later brought down to six years. Kenny Dalglish took over management of the team after Fagan stepped down. The club won two FA Cups and three League Championships during Fagan’s tenure. The tragedy of the Heysel Stadium was repeated in the Hillsborough disaster as hundreds of fans were crushed against a fence at the FA Cup semi-final where Liverpool F.C. faced Nottingham Forest. The tragedy claimed 94 lives at the stadium and another two died in hospital from fatal injuries. The incident led to new legislation to help avoid such tragedies in the future. The main reason behind the incident, as cited in the report, was overcrowding and inadequate police control. During the 1988 to 1989 season, Liverpool F.C. had one of the closest season finishes as Liverpool F.C. and Arsenal were equal on goal difference and points. They lost in the end as Arsenal scored a goal in the last minute of the football season. Dalglish talked about the Hillsborough incident as the main reason for his retirement as team manager in 1991. Graeme Souness replaced him and took the team to the 1992 FA Cup Final where they won. After the win, the team hit a slump finishing sixth for two consecutive seasons leading to the dismissal of Souness in 1994. Check Liverpool FC Tickets Here. Roy Evans took Souness’s place as team manager securing a Football League Cup Final in 1995. The team placed third in 1996 and 1998 leading to Evan getting a co-manager, Gérard Houllier. Houllier became the sole manager in November 1998 after Evan stepped down. With Houllier at the helm, the team won the League Cup, UEFA Cup and the FA Cup in the same year claiming the “Treble”. During the season in which Houllier received heart surgery, Liverpool F.C. placed second in the League and went on to win the League Cup in 2003. They failed to win the Cup the following two seasons. In the 2003 to 2004 season, Rafael Benítez took Houllier’s place. The team took first place in the 2004-2005 UEFA Championship League in the game against A.C. Milan, going 3-2 in a penalty shootout. Liverpool F.C. won their next final in the 2006 FA Cup Final where they beat West Ham United in a penalty shootout again. In late 2006, Tom Hicks and George Gillett bought the club for £218.9 million. The club got to the final of the 2007 UEFA Championship League but lost against Milan 2-1. During the next season, the club managed to get the highest points, 86, and finished the season as runners up behind Manchester United. The 2009 to 2010 season saw Liverpool F.C. finish seventh in their Premier League season and did not manage to make qualifications for the Championship League. Benítez subsequently left the club and was replaced by Roy Hodgson, the Fulham manager. Financial troubles then hit the club as creditors made a request to the High Court for the sale of the club. The motion was granted and John W. Henry then took ownership of the club in October 2010. John W. Henry is the owner of the Fenway Sports Group and the Boston Red Sox. The poor performance of the club in the start of the season caused Hodgson to leave and be replaced by Kenny Dalglish, a former player and manager. He was not manager for long as the club finished in eighth position during the 2011 to 2012 season, the worst finish in 18 years. Dalglish was then replaced by Brendan Rodgers and the club finished seventh in his first season as club manager. The following season, Liverpool Football Club managed to finish second behind Manchester City allowing for their return to the Champions League. As a team, they scored 101 goals – the highest since the 1895 to 1896 season. Rodgers was sacked after a disappointing 2015 season. Jürgen Klopp was his replacement becoming one of only three foreign managers in the club’s history. He managed to take the club to the finals of both the UEFA Europa League and the Football League Cup but failed to win either Cup. Liverpool Football Club Team Colours. Liverpool F.C. has retained their all red home colours for much of their history. When the club was initially formed, they had a blue and white kit similar to the contemporary Everton kit since it was linked to their origins. The red kit was adopted in 1894. The liver bird symbol was introduced as the club’s badge in 1901 and introduced to the kit in 1955. Their kit was converted from a red shirt and white shorts to all red in 1964. The team’s away colours are usually all yellow, yellow with white shorts or yellow with black shorts. There are several exceptions to their away colours such as the grey kit that was introduced in 1987. In the 1991 to 1992 centenary season, green shirts and white shorts replaced the all grey kit. Other kits seen in the 1990s included the gold and navy, black and grey and bright yellow kits. Liverpool F.C. alternated between white and yellow away kits until the 2008 season where they opted for their all-grey kit again. The team’s current kit is designed by Warrior Sports. They took over as the team’s kit providers in the 2012 to 2013 season but in February 2015, New Balance became the company that provided their kits. New Balance is the parent company of Warrior Sports. The branded shirt history of the club saw Umbro as their sponsor until 1985 when they were placed by Adidas until 1996. Reebok then took over for the following 10 years until Adidas took over the kits from 2006 to 2012. Liverpool F.C. was the first British football club to incorporate a sponsorship logo onto their shirts after signing an agreement with Hitachi in 1979. The club has seen several sponsors since then including Candy, Standard Chartered Bank, Carlsberg and Crown Paints. The sponsorship deal with Carlsberg was the longest running sponsorship agreement in any English football club, originally signed in 1992. It ended in the 2010-2011 season when it was replaced with the Standard Chartered Bank sponsorship deal. The club badge has a representation of the liver bird and in 1992, the badge was changed to include the Shankly Gates. The following year, twin flames were incorporated as a memorial to the Hillsborough disaster, honouring those who lost their lives in the tragic event. In 2012, the badge was brought back to its 1970s state, prior to the adding of the Shankly Gates and twin flames. The flames were added to the back collar of the number 96 jersey to remember the 96 who died at Hillsborough. Adam Lallana plays as an attacking midfielder for Premier League club Liverpool and the England national team. Lallana began his playing days with Bournemouth before transferring to Southampton in 2000 and went professional in 2006. Hes started plying in Southampton’s first team and gained promotions from League One to the Premier League, He became captain in 2012. He joined Liverpool for a reported £25 million in July 2014. Find out more about Adam Lallaner here. James Milner was born on the 4th January 1986 plays for Premier League club Liverpool. A versatile player, he has played in many positions such as in midfield, the wing and left-back.Milner, an all round sportsman spent time at Leeds and Swindon Town to gain experience as a first-team player. He then went to Newcastle United, and was loaned to Aston Villa for a season. James made more than 100 appearances for Newcastle and a record number of appearances for the England under 21s. He transferred to Liverpool Football Club in 2015. More about James Milner here. Jordan Henderson has played forr Liverpool F.C. since 2011. Henderson became captain for the Reds in 2015. He also plays for the England National Team. The position he is usually placed in is central midfielder – a position where he has the most impact as a player…..
Nathaniel Edwin Clyne was born on the 5th April 1991. He now plays as a right-back for Premier League club Liverpool and the England national team. His career started at Crystal Palace, playing for them for four Championship seasons, before moving to Southampton in 2012. There he spent three seasons and joined Liverpool in July 2015 for a fee of £12.5 million. An international player at under-19 and under-21 level, Clyne made his senior debut for England in November 2014. More about Nathaniel Clyne Here. Liverpool’s Philippe Coutinho Correia who was born in Rio de Janeiro, Brazil on the 12th June 1992 is an attacking midfielder or winger. In his formative years he excelled in Vasco da Gama’s youth system and was signed by Italian side Internazionale in 2008 for €4 million then loaned back to Vasco. In January 2013, he joined Liverpool for £8.5 million. His skills in passing, dribbling and long-range strikes earned him the nickname “Little Magician”. Liverpool Football Club’s attacking midfielder Roberto Firmino Barbosa de Oliveira was born on the 2nd October 1991. He is a Brazilian professional footballer who plays for Premier League club Liverpool and the Brazil national team. He started his football career with Figueirense in 2009 and spent four-and-a-half seasons at their. His fantastic performance the 2013–14 Bundesliga season earned him the title of Breakthrough Player. He signed for Premier League club Liverpool in 2015. Sadio Mané was born on the 10 April 1992and is a Senegalese professional player now playing for Liverpool and the Senegal national team. He began playing with Metz in France and transferred to Red Bull Salzburg in 2012. After winning the Austrian Bundesliga and Austrian Cup in 2014, he transferred to Southampton. In 2015, Mané set a new Premier League record for the fastest hat-trick scoring the hat trick in 176 seconds during a 6–1 win against Aston Villa. Sadio came to Liverpool in 2016 for a fee of £34 million. Find out more about Sadio Mane. Jürgen Norbert Klopp was born 16 June 1967 in Germany. He was a former professional player and manager and is the current manager of Liverpool FC. Klopp spent most of his playing days at Mainz, before becoming their longest-serving manager from 2001 to 2008, when the team achieved promotion to the Bundesliga. In 2008, Klopp joined Dortmund, gaining Bundesliga wins in 2011 and 2012, as well as the DFB-Pokal in 2012, the DFL-Supercup in 2013 and 2014, plusetheir appearance in a UEFA Champions League final in 2013. Klopp won the German Football Manager of the Year in 2011 and 2012. He left Dortmund in 2015 as their longest-serving manager. He became manager of Liverpool in October 2015. 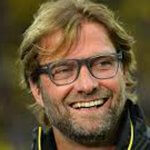 Find out more about Jurgen Klopp. Liverpool F.C. home stadium: Anfield. The Anfield club stadium was initially used by Everton after its construction in 1884. It was built on the land adjacent to Stanley Park. After a dispute over rent with owner John Houlding, the land was left empty until the founding on Liverpool F.C. in 1892. The club took over the grounds and has been playing there ever since. While the stadium could initially house 20,000 fans, the first club game only had 100 fans attending. The banked stand on the one side of Anfield was named Spion Kop after a hill in South Africa in 1906. The hill in KwaZulu-Natal was where the Battle of Spion Kop was held during the Second Boer War. Over 300 people from the Lancashire Regiment died in the battle. Many of the soldiers that died were from Liverpool. Spion Kop was able to hold 28,000 fans at its peak making it one of the largest single-tier stands in the world. The Spion Kop stand was able to hold more people than most full stadiums at the time. Anfield itself was able to house 60,000 fans at its peak with a capacity of 55,000 all the way up to 1990. The Premier League and the Taylor Report regulations limited the capacity to 45,276 supporters. The Kemlyn Road Stand was rebuilt in 1992 during the club’s centenary and was named the Centenary Stand. The Anfield Road end of the stadium received an extra tier in 1998, increasing the stadium’s capacity but it caused several other problems. Movement in the new tier was reported in the 1999-2000 season, prompting the installation of extra support beams. Due to the various restrictions placed on Anfield, plans were announced concerning Liverpool’s move to the Stanley Park Stadium in 2002. Permission was granted in July 2004 and a lease was granted by the Liverpool City Council in September 2006 for a 999-year lease. The proposed stadium was redesigned after Tom Hicks and George Gillett took ownership of the club in February 2007. The new stadium design received approval in November 2007. The scheduled opening of the new stadium was set to August 2011 with a maximum spectator capacity of 60,000. Due to financing difficulties, Hicks and Gillett halted construction in August 2008 with £300 million still needed to complete development. After the team’s acquisition by the Fenway Sports Group in October 2012, BBC Sport reported that the new owners decided to revamp the current Anfield stadium instead of constructing a new one. The redevelopment was said to cost £150 million and would increase the 45,276 spectator capacity to 60,000. Liverpool F.C. has long been one of the most supported football clubs in Europe. The club has more than 200 official supporters Clubs worldwide in around 50 countries. Some of the most notable groups include Reclaim The Kop and Spirit of Shankly. To interact with its many supporters, the club takes part in worldwide summer tours. The term Koptites is often used by Liverpool fans as reference to themselves in support of the fans that once stood and now occupy the Kop at Anfield. In 2008, a group of fans formed a splinter group of fans called A.F.C. Liverpool to allow fans who have been priced out of the Premier League Football to watch matches. The club’s anthem is a song called “You’ll Never Walk Alone” that was recorded by Gerry & The Pacemakers, Liverpool musicians. 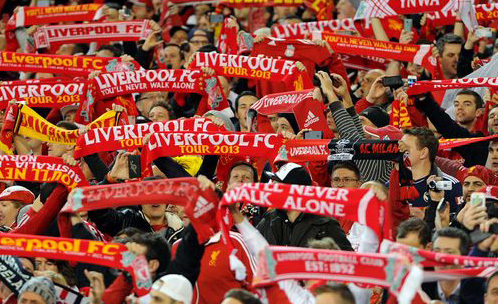 The song has been sung since the 1960s by fans at Anfield. The song has become so well known that it is often sung by other clubs worldwide. A memorial of Bill Shankly was unveiled on 2 August 1982 with the song’s title adorning the Shankly Gates. The main rival that Liverpool has is Everton, another Liverpool-based team. This long-standing rivalry dates back to the initial disputes the two clubs had during Liverpool’s formation as previously discussed. Other football clubs usually have rivalries based on location, politics and religious differences. This is not the case with Liverpool F.C. and Everton as they share many similarities such as their geographical location. The two clubs contest in the Merseyside Derby and tickets to the event are always sold out. The event does not enforce fan segregation and has been given the name of the “friendly derby”. Since 1992, the event has seen more players sent off the field than any game in the Premier League. The rivalry is not limited to just the games and has intensified since the mid-1980s. The event is known as a very explosive and ill-disciplined game. Liverpool has other rivals including Manchester United. Many believe that this stems from the competition between the cities during the 19th century Industrial Revolution. Liverpool and Manchester alternated championship titles between 1964 and 1967. Manchester was the first English team to win the European Cup (1968). Following the victory, Liverpool won the cup four times. Both clubs have been successful but usually not at the same time. While Liverpool won numerous titles in the 1970s and 80s, at the same time Manchester United saw a 26-year title-less drought. The last time a player transferred between the two clubs was in 1964. This section looks at frequently asked questions related to the sale of tickets for Liverpool F.C. home and away games held each football season. If you have any further questions, do not hesitate to contact a representative at www.ticket4football.com. Q: Where is the best place to buy Liverpool F.C. match tickets? A: Directly from www.ticket4football.com. You can discover great deals with the click of a button. Q: How do I buy Liverpool F.C. tickets (away and home games)? A: Simply go to the Buy Liverpool Tickets section and choose which game you want tickets for – away or home – and click Buy Tickets. Q: Do you have Liverpool F.C. season tickets for sale? A: No, only individual match tickets at this time. Q: Where can I get Liverpool ticket information? A: By selecting the particular match you are interested in, you will find out information such as the date, venue, ticket prices, and the number of tickets available at the time. Additional information is also provided for each individual ticket. 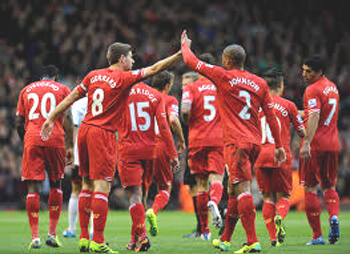 Go to this page, select the Liverpool game you are interested to get detailed information. Q: What is your Liverpool ticket hot-line office number? A: Call +44 (0) 208 432 2850 for Liverpool tickets. Q: When do Liverpool F.C. tickets go on sale? A: Usually tickets are available for mid June onwards. Q: How much do Liverpool F.C. tickets cost to buy? A: Prices vary depending on the venue and seating section. 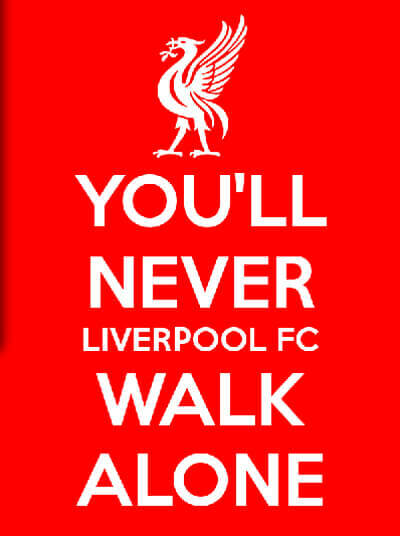 You can visit the Buy Liverpool F.C. tickets section to see prices for the game you are interested in. Q: How much is a season ticket for Liverpool F.C.? A: We do not offer season tickets at this time.